First of all, many thanks to everyone who left me a comment (or sent me an e-mail or tweet) with Paris reading and/or visiting suggestions. I can’t tell you how much I appreciate it. I used your book recommendations to compile the reading list below – I didn’t include more books not because I don’t think the suggestions I got were all great, but because I know that realistically there’s a limit to how many books I’ll be able to get a hold of and read in the next month and a half. I also left out a few books (Suite Française, Anna and the French Kiss and Books, Baguettes and Bedbugs aka Time Was Soft There) simply because I’ve already read them. A Moveable Feast by Ernest Hemingway — Like I said before, I want to make sure I read at least this book before my trip. I confess I’m not very drawn to Hemingway in general, but this still sounds like something I’d really love. The Paris Wife by Paula McLain — A historical novel told from the point of view of Hemingway’s first wife, Hadley. It sounds like a great companion read to A Moveable Feast. The Dud Avocado by Elaine Dundy — The story of a young American actress in Paris in the 1950’s. Plus it’s a Virago Modern Classic, which practically guarantees I’ll like it. In this enchanting memoir, acclaimed author and Paris resident John Baxter recounts his year-long experience of giving literary walking tours through the city. Along the way, he tells the history of Paris through a brilliant cast of characters and their favourite haunts: the cafés of Hemingway, F. Scott Fitzgerald, and James Joyce; Picasso s underground Montmartre dives; the bustling boulevards of the late-19th century flâneurs; the secluded Little Luxembourg gardens beloved by Gertrude Stein; and finally Baxter s own favourite walk near his home in Saint-Germain-des-Prés. French Milk by Lucy Knisley — A graphic memoir about the author’s time in Paris with her mother, and a book that has been on my radar for ages but I’d kind of forgotten I wanted to read. Something by Collette — Because it’s about time I read her. I have Gigi and the Cat, so perhaps I’ll start there. Do you think that would be a good choice? Under a Glass Bell by Anaïs Nin — Another author I’ve really been meaning to get to for ages. The Belly of Paris by Émile Zola — The publisher describes this novel as painting “a picture of a world in which food and the injustice of society are inextricably linked”, which sounds incredibly interesting. I have a question about this book, though – there’s a free English language version on Project Gutenberg, but I know that older translations aren’t always the best quality. Does anyone happen to know if this is a decent one? Would it be a mistake to read it instead of a more recent version? Paris to the Moon by Adam Gopnik — A collection of essays by an American journalist in Paris. Have you read any of these? Which ones do you think I should prioritise? Also, is there anything I left out of my list that you think I really should have included? If so, I’m all ears. A fine list, Ana! My dad is currently reading The Most Beautiful Walk in the World and keeps going on and on about it. I've read a bit of it and it's pretty interesting. Oh, and I do hope you get to see Midnight in Paris after reading A Moveable Feast! The only one I've read is French Milk and you should read it because it's a quick read. You should also let me know if you find any of the milk she's referring to in the book. I thought The Paris Wife was dreadful (and that opinion was pretty much unanimous in my book group as well). I'd read everything else on your list first! The Most Beautiful Walk in the World sounds wonderful. That would be my pick followed by The Dud Avocado. Enjoy! Yay for The Dud Avocado! As for Colette, I think The Cat is a cool story (and not very long), although Gigi is not quite on my very best list (although all Colette is worth reading :-) ). Otherwise, I'd suggest for you The Ripening Seed, for its intriguing representation of gender construction, way back in the day before anyone had ever theorised about it! And most of all, have a wonderful time! I am so excited for your trip! The Most Beautiful Walk in the World will definitely get you in the mood for Paris. I loved that book! Ooh, The Belly of Paris and French Milk are both fantastic! Unsurprisingly, I've read none of those, so I can be of zero help. But I totally agree with you that "a picture of a world in which food and the injustice of society are inextricably linked” sounds absolutely fascinating! Sounds like a great list to me! I think you've got a wonderful blend of modern and older works in there so that you'll have a great way to enhance your Paris experience no matter your mood! You are going to have the best time! What a wonderful list! I really loved A Moveable Feast and thought that The Paris Wife was a perfect companion read to that one. French Milk was wonderful too and Paris to the Moon was fun. A lot of these books are on my wishlist, and have been for a really long time. I agree with Melissa that reading a bit of Hemingway before reading The Paris Wife is a great idea. I hope that you have a wonderful time, and that the books you've picked are the perfect companions on your trip. You are so lucky to have such an amazing partner! I want to know what you think of French Milk! (I haven't read it yet.) Have fun in Paris! I too fell for the publisher's blurb about "Most beautiful Walk in the World" & I am finding it very disappointing. "Dud Avocado" is great & I enjoyed "The Paris Wife". I recently got a copy of Gigi and the Cat for myself, after loving The Vagabond. You've inspired me to pick it up! Great sounding list. I might have to spend some time in Paris reading, soon! I haven't read any of these (*gulp*) but I do have a friend who read Paris to the Moon and loved it. He precisely read it before and took it to his trip to Paris! I tried French Milk but didn't get into it. It was a little too self-conscious for me. You HAVE to read The Belly of Paris! Also any other Zola book ever written. While you're at it, how about Balzac's Omelet? Do visit the Rose Bakery eatery in the 11th arrondissement. Just lovely food! What a wonderful list! 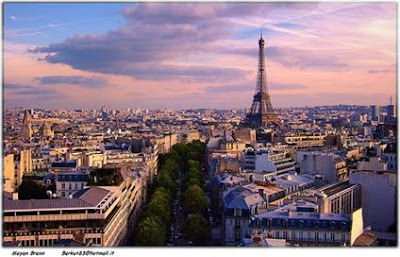 I'm sure reading about Paris will make you even more excited about your trip! I haven't read most books you mentioned (though I'll be sure to keep this list for if I ever visit Paris again), but I have read The Dud Avocado. I did not love that as much as I would have hoped, but I think it might be a better fit for you. With the Hemingway, the Gopnik book (which I enjoyed), and the one about the literary walk, you sound like you'd be all set. We had a wonderful tour with a guide who had lived in Paris all his life; he showed us a lot of history which added to our own emphasis on literary history. That was free but we reserved it at Paris City Guides. Try Paris Was Ours, a collection of writers reflections on the city, edited by Penelope Rowlands. Great read. I think you are going to Paris?! Wow! I haven't read any of these books, but I am sure I will add this to my list :) Enjoy! I bought The Most Beautiful Walk in the World the night I went and saw Midnight in Paris. I put it down months ago and havne't picked it up again! I did really enjoy John Baxter's other book The Immoveable Feast which is all about getting a French Christmas meal together. French Milk is a lot of fun. A good book for light reading while you travel. Hello Nymeth, your list looks fascinating! From it I've only read 'The Dud Avocado', long ago, but I remember it as being charming. I know you already have plenty of books, and I haven't even read this one myself, but a book I have read good things about is Gillian Tindall's 'Footprints in Paris', in which she researches some family history in the Latin Quarter of Paris; she is said to be marvellous at evoking place. What a list! I hope you enjoy French Milk and The Dud Avocado. I've read so much about them. Hope you enjoy reading French Milk! I love that journal! I loved the John Baxter book. Its a great resource to have on-hand in Paris in general. I got a lot of use out of that title when I was in Paris last year. Also check out my Bonjour Paris page (http://thenovelworld.com/bonjour-paris/). Its my list of all the books I've read that are set in France or Paris. The Dud Avocado absolutely won me over when I read it a couple of years ago. I don't buy many books but I bought that one. I really enjoyed Claudine at School by Colette. It doesn't take place in Paris however. The next Claudine book does take place in Paris but I couldn't get into it. Claudine was best when she was lording over her domain at her provincial school. I'm so happy you want to read The Belly of Paris, which was the very first novel I ever read by Zola. However, I do have to warn you that the Project Gutenberg version is the edition translated by Vizitelly in the 1800s, and is not a very good translation -- the Vizitellys were British publishers who were forced to heavily edit the original Zola texts to avoid criminal charges for obscenity based on Zola's other works. I don't remember that particular book being especially raunchy, so it may not have been very much changed, but there are other excellent translations available (though they won't be free). I read the Mark Kurlansky translation published by Modern Library and thought it was wonderful. There's also an Oxford World Classics edition translated by Brian Nelson. I haven't read that one but I've read some of his other translations of Zola and they were excellent. And I have The Most Beautiful Walk in the world in my locker at work -- I snagged it from the library sale and still haven't brought it home! Have an amazing trip, can't wait to read all about it. I read Gigi and The Cat and they were both really good - light and quick so I'd say they're a perfect addition to your list. The Baxter one about the literary walks sounds amazing!! Have a great time!